While I did notice their sign from a while back, I didn't really become interested to find out more, thinking like, oh, it's another cafe with so-so food that I've seen too much. 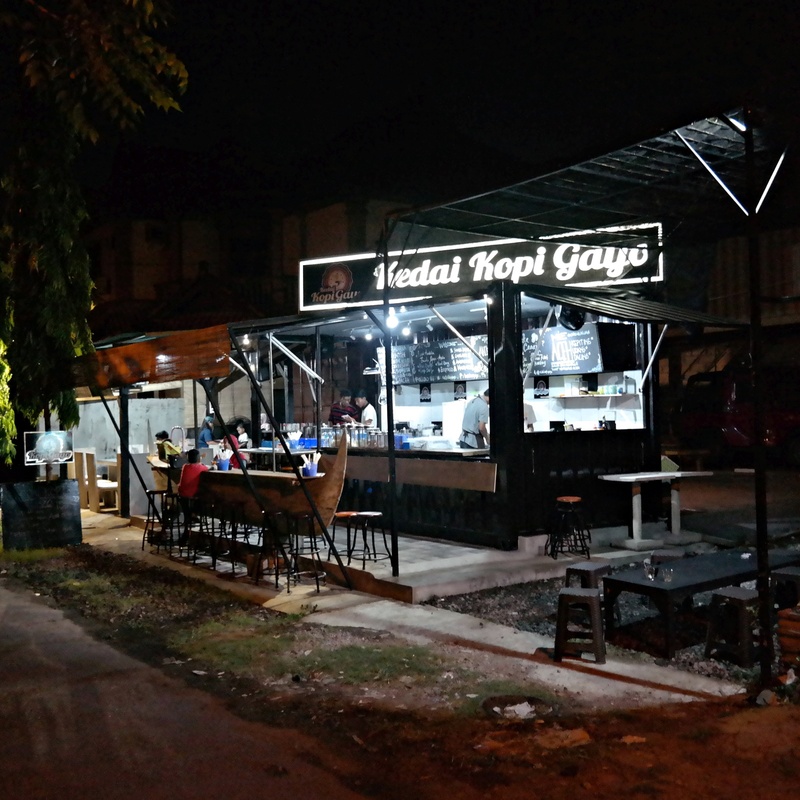 It was only after getting tagged on Instagram post about Mie Aceh, and it's been a while since I had any, I made the effort to turn my car toward the street where Kopi Gayo resides, and wow I was impressed! Turned out it's an actual Warung Kopi, sits right next to the street, set in a very casual setting with a long boat that used as the main table, neat minimalist design and lots of light! Immediately we made a plan to visit them the next night. Scouting the menu we discovered that they're quite serious. After some conversation with the owner we also found out that he's coming from Aceh, and just been living on the island for about two months. 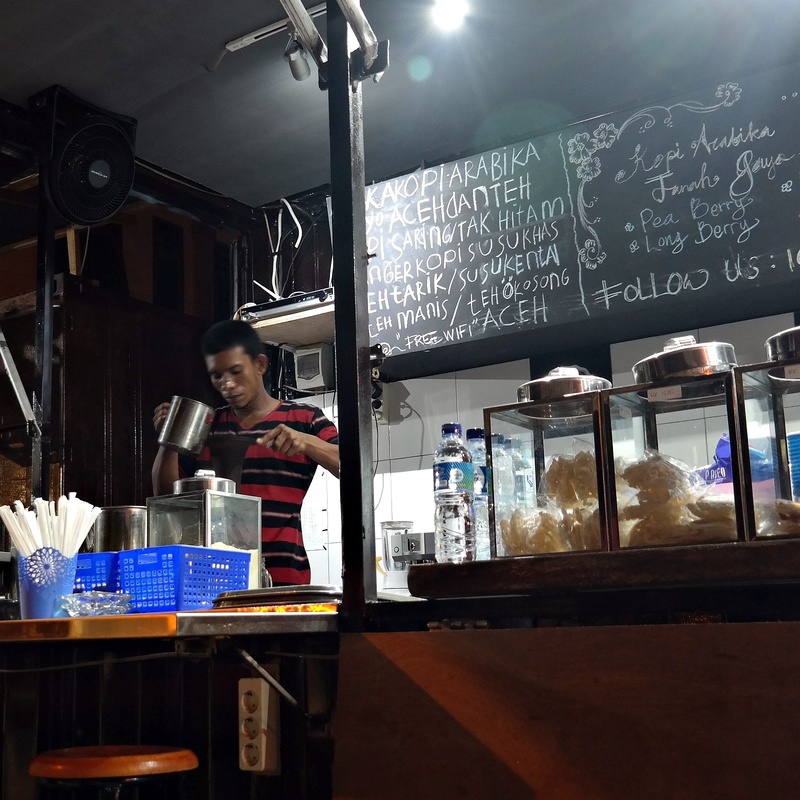 Surely as Bali Food Blogger we become more interested in what Kopi Gayo has to offer. To start our journey we ordered Kopi Sanger which is a favorite in Banda Aceh: it's the mix of 3 parts black coffee with 1 part condensed milk, where the coffee is filtered using conventional cloth coffee filter (pictured above). 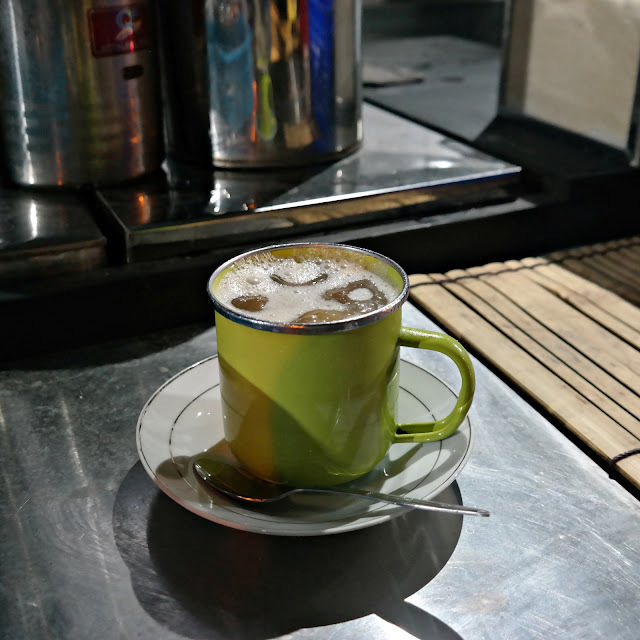 The result is a bitter sweet coffee drink carrying both the traces of Gayo coffee and sweet condensed milk. A good company for long conversation. As the main dish we ordered both Nasi Rempah Ayam Tangkap, and Mie Aceh Sapi Goreng. I was aiming for the more lavish variation, Mie Aceh with Crab, or with Prawns, but they're already running out of stock for both items. Should try it next time when the day is still young. Turned out they're open from early morning at 6:30 am for breakfast. The Mie Aceh combines thick udon-like but softer yellow noodles, with savory sour and spicy thick sauce that bathe the noodle like a spaghetti sauce. Comparatively while we love how the flavor stands out, we think it's a bit spice shy compared to the rustic smokey specimens we usually have from our favorite vendor in Pemogan, Rumoh Aceh. For the other main menu we choose Nasi Rempah Ayam Tangkap which on first look resembles Nasi Goreng with heavy dose of spices put in. 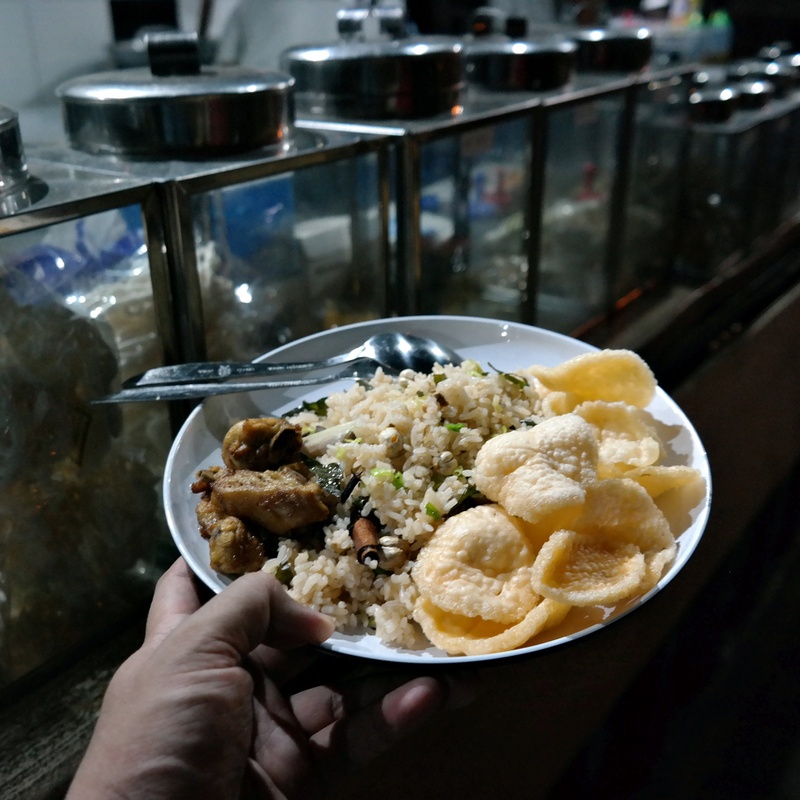 The taste however, was not as wild as I first suspected, and on a food diagram it would be grouped more with Nasi Hainan and Nasi Kuning, than with Nasi Kebuli. The addition of whole cardamom help adding the exotic nuance, however it wasn't really blended into the rice to create the true rustic feels. We did also try their Teh Tarik, and Martabak Aceh, but was too involved with the food to take a shot. Martabak Aceh differs with the usual Martabak Telur, as it's an "inside-out" martabak where the fillings is outside and its crusty skin inside.